These car coasters fit inside of your car’s cup holder to keep them clean and dry. 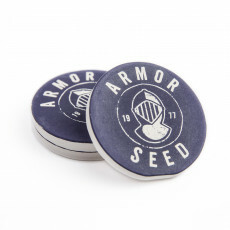 This handy set includes two round stone coasters with finger notches for easy removal. Protects your cup holders from sticky messes and adds a personalized touch to your vehicle. Coasters are made of dolomite for long-lasting use. Size: 2-9/16" diameter x 1/4"